Worst photo ever, taken by me, last night, on the way home from the Italian Village. Every time I return from being out of town for a few days, I see that something has changed around the big hole on Sheridan at Pratt, just outside the 7-11. I come back and find a new cone, or new blinky light, or something added to improve the visibility of the giant hole. This time, they've gone all out. The put up a fancy barrier with yellow safety tape all the way around. It's great that they're concerned about this thing. Somebody's paying attention. I expect the barrier/warning/cover/whatever around this thing to grow bigger and more impressive until it begins to look like an ice fishing house. Or? 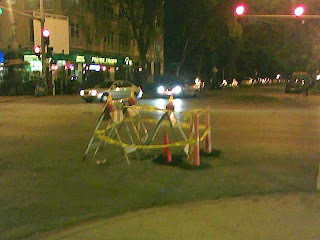 I had another thought: The city could just fix the hole. It's a sunken manhole cover or something. I imagine it takes a bit of work to repair, but it's it's been this way for months, and it is a dangerous hazard. Good thing I don't have a car right now; maneuvering around it in a vehicle is a hassle. Hertz, are you kidding me?